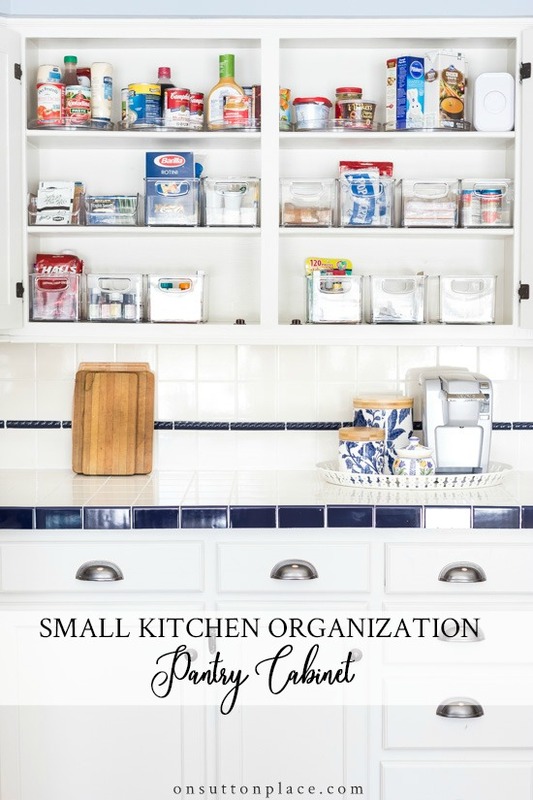 Small Kitchen Organization: Pantry Cabinet. 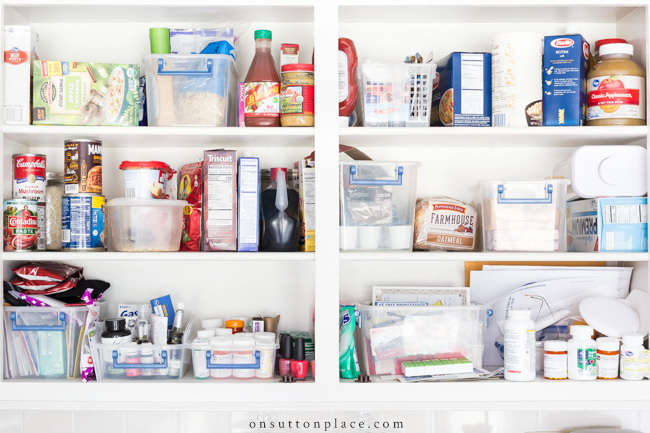 Tools and ideas for organizing a pantry cabinet. How to get the most out of a small space. My kitchen organization project has begun. I’m not quite halfway through and it’s slow-going, but I’m hanging in there until the end! Pictured above is our only “pantry” space. I don’t have a pantry closet or even a tall cabinet. This is it, and as you can see, it was a disaster. The biggest problem with this cabinet was that I couldn’t see or get to the top shelf. I can reach it, but barely. The other main issue was that the existing bins were white and tall, so I couldn’t see what was in them. It always looked like a big jumble of mixed-up stuff. To make everything accessible, especially the top shelf. 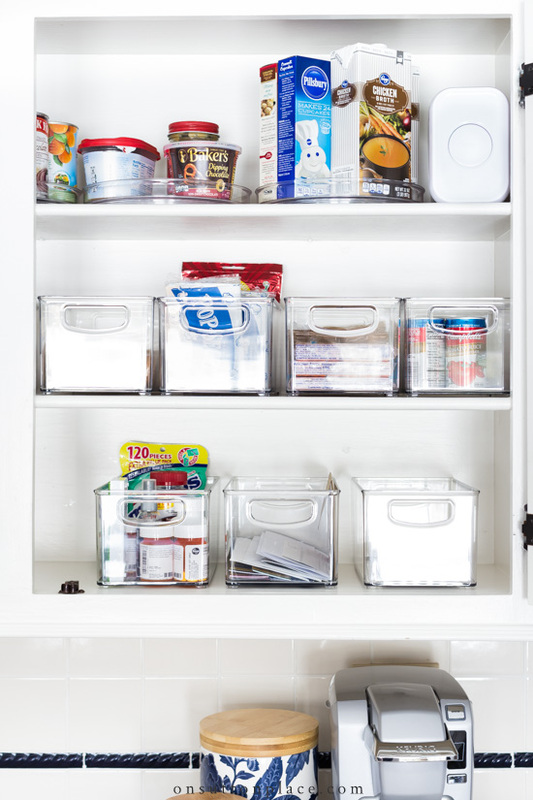 Organize with clear bins so I could see everything. The bins had to be small so I could easily pull them in and out. This is the system I use to organize absolutely everything. I have found that if I skip even one step, I’m not happy with the end result. Since the inside of my cabinets are painted, I used Clorox Clean-Up and Magic Erasers to clean everything. Together, they did a great job. The hardest part for me is the editing, but with this kitchen organization project, I am being ruthless. If I don’t use it, it’s not staying! *The bins reflected the light so my apologies for the glare in the photos. Lazy Susans: The only way I felt the top shelf could ever be functional was if I used lazy Susans. I could reach the very front of the shelf, but not the back. Lining up the lazy Susans and organizing the items completely solved this problem. Clear, small bins: I knew I wanted clear bins because the existing white ones were not working. I couldn’t see what was in them. I also wanted smaller bins so I could easily lift them in and out of the cabinet. Because my shelf depth is so small, my choices were limited. After looking for a long time, I found these 10 inch clear bins. It took twelve of them, but they are perfect. Top shelf: canned goods and items I don’t use very often. Middle shelf: snacks, coffee, tea, and items I use on a regular basis. Bottom shelf: Medication, essential oils, misc. items. I’m very happy with the way this pantry cabinet came together. It’s nothing fancy, but it’s functional and there’s room to grow. The total cost for this cabinet was $180.00. I got the lazy Susans as a Christmas gift, so that really helped keep the cost down. I already had the Oxo container (it holds our saltines) and the Magic Erasers. This is the most-used cabinet in our kitchen, so I felt strongly about purchasing the proper organizing tools. I cannot tell you how happy it makes me to open this cabinet. I can see everything, but more importantly, I can access everything. Now…on to the baking cabinet! I realize that many of you have more than a pantry cabinet. For more ideas, just click the links below! It looks so organized. Amazed at how much difference clear containers made. I am so glad I am not the only one who keeps meds in the kitchen. Great ideas thank you. Keep them coming. Thanks for the great post. Like you, I have limited cabinet space, and I also struggle to get to the top shelf. 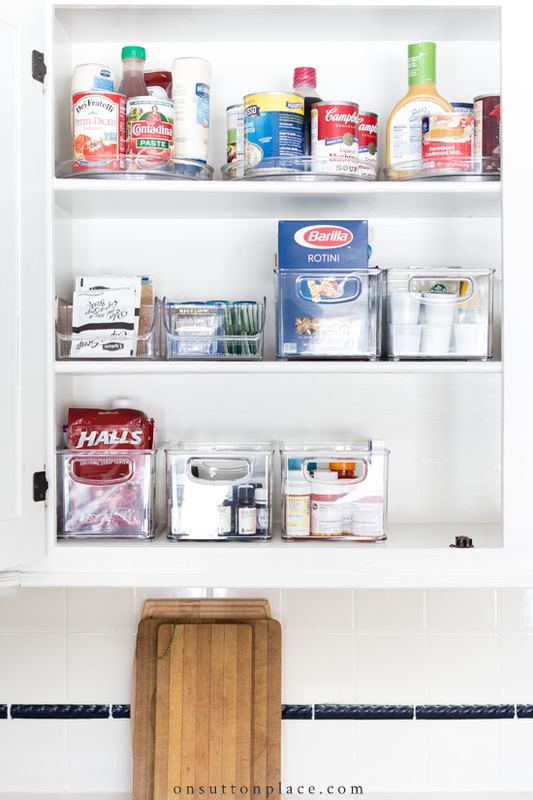 I love the clear bins, and they are now on my Amazon wish list. I also have invested in some of the OXO clear pop up containers. They are great for holding my flour, sugar, etc. I like how you are so honest about telling us your costs and understanding how these items add up. I am looking forward to your post on your baking supplies. It’s nice to see a small area organized. Not all of us have a walk in pantry or a 3000 square foot house to go with it. Thank you for continuing to be one of my favorite blogs. You’re the BEST ! I use those same clear bins and lazy susans in my refrigerator, they work really nice to keep dressings and condiments organized. I am surprised that you aren’t using a hall closet to store the medications, etc. in. This was my Saturday job. I was so pleased with myself at the end of the day!! 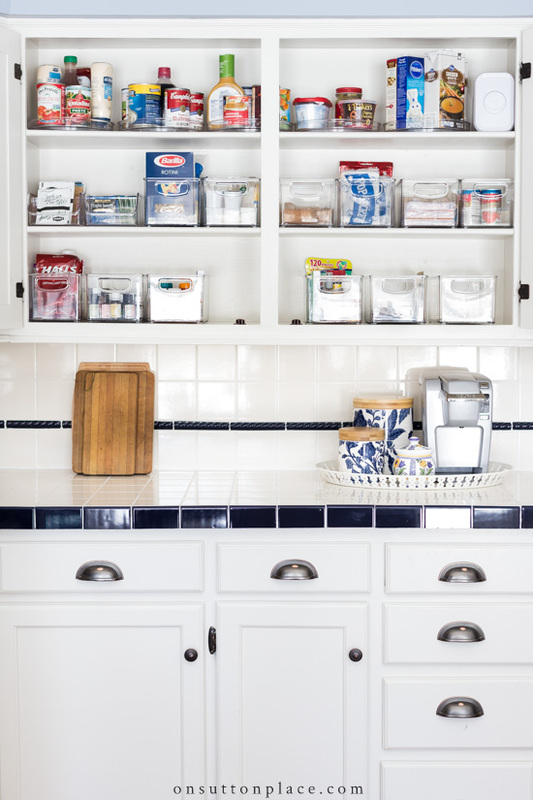 Love the lazy susan idea on the top shelf! As I get older, standing on a stool to reach is less inviting! Lazy susans are the best! I have 2, and each one is TWO plates (not one!) And I have both of them in the same cupboard. The bottom shelf one holds all my spices, and the top shelf one holds vitamins and meds. They are right next to my stove for easy access. And I will look into those clear acrylic boxes – they look extremely useful! Ohh My Gosh!!!! That looks so neat, clean, organized and handy! Love it. Wish I had the ambition to tackle my cabinets. Maybe when Spring gets here and weather cheers me up a bit I can get at it. Had already planned to clean the outside of mine but now that I see what the inside can look like, I think it’s gonnna be a total overhaul!!! I also love your white! Thanks for your post; very nice job. Looking good Ann ! The clear bins and the lazy Susans are a plus.Good luck with the baking cabinet ! Beautiful Job! Another job well done! What brand name are the clearness bins. They look of good quality. I would like to purchase for my cabinets. Many thanks, and for sharing. Hi Nicole…the links to the bins and lazy susans are near the end of the post. You are right…the quality is excellent! I also went to clear containers in my pantry almost a year ago. I had the same problem as you Ann with white containers. YOU CAN’T SEE IN THEM. I also purchased quiet a few OXO clear containers with the push botttom top for baking supplies. (Got them at Home Goods a little at a time) And I have to say that it is much more organized, I dont buy duplicates anymore. Our spice cabinet is the corner cabinet Lazy Susan. We alphabetized the spices my husband uses and the baking spices have their own section. It is much more efficient. Also eliminated duplicates and out of date items. It has stayed pretty well organized since. I also agree don’t skip any steps in the process. Take EVERYTHING out, clean, purge, organize. Great post!! It looks great! Love the clear bins. I also like to label my bins…the ones that are high up especially so I know what is in them. I also keep my baking items in a separate cabinet. Eager to see what you do. Even though there are only two of us, we shop at Sam’s Club a lot so need a lot more pantry space than this. I do have a tall pantry cupboard with pull out shelves that I love. Nothing gets lost in the back. Multiples of things and case lots get stored on metal shelving in our basement. 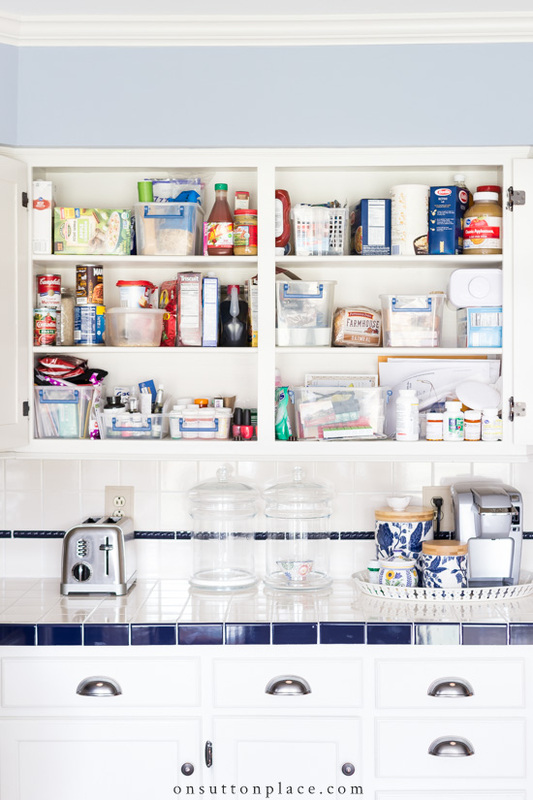 Your pantry cupboard looks so neat. I love organizing. I would open those doors every time I went through the kitchen just to admire my work. LOL. Your post inspires me to do something about my small pantry and refrigerator. I recently moved into an apartment after after selling my house that had two pantries in the kitchen. I don’t cook as much anymore, but I still need the basics and my pantry seemed a hodpodge of items. Going to do some measuring and see what sizes would work the best. Purchasing clear bins makes so much sense. Thank you for sharing, Anne. Kudos for your organization skills! I am so fortunate to have a pantry closet so I can usually keep it pretty presentable. What I would love to see is how you, or anyone for that matter, organizes and keeps, a spice cabinet, neat and efficient. Mine is a disaster, which leads to lots of duplicates. With the cost of spices lately that’s not good. Thank you Ann for everything you do for your readers. I enjoy your blog very much. Last year I cleaned & rearranged my kitchen since I was also cleaning up my diet. I ended up getting rid of a lot of spice mixtures since they all had some type of additive or sugar, as well as some were just hidden and gotten old. I checked the cookbooks for what type of spices I was probably going to use the most as well as mixtures to make. I bought glass jars in two sizes – 4.5 oz and 12 oz. – and restocked the herbs and spices by projected use. I put the jars in two drawers in the area that I decided was going to be my prep area. I used drying mats in the drawers so that the jars wouldn’t rattle and slide. I ended up putting my new mixtures in the smaller jars since I wanted to keep the mix fresh. BTW, I put a lot of kitchen stuff into boxes and only stocked the shelves with things I use the most. It’s been a year, so I went through the box and donated about 3/4 of it. The lazy susans from the old spice storage method are in my refrigerator. If there is a way to send you a picture of my spice drawer I would be happy to…maybe somehow we can do this through Ann. Everyone loves my spice drawer. I purchased the liners locally at The Container Store but Amazon also sells the same set. You Coupia Spiceliners. I have it in the drawer to the right of my stove. I lay them out alphabetically and it is just so simple to track what I have on hand. above. But those are limited to ones I use weekly (4) as I like my dry spices to be fresh. 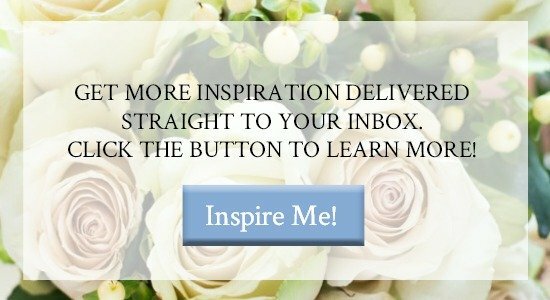 Many good ideas and sources! Thank you so much, Ann! Congratulations on conquering that space! 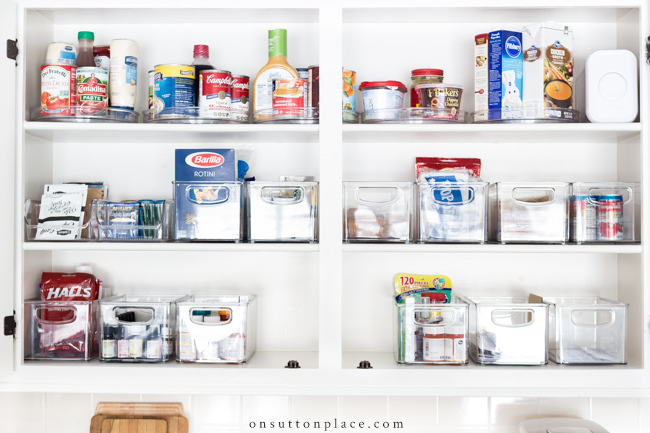 Thank you for a post on organizing regular pantry cupboards! 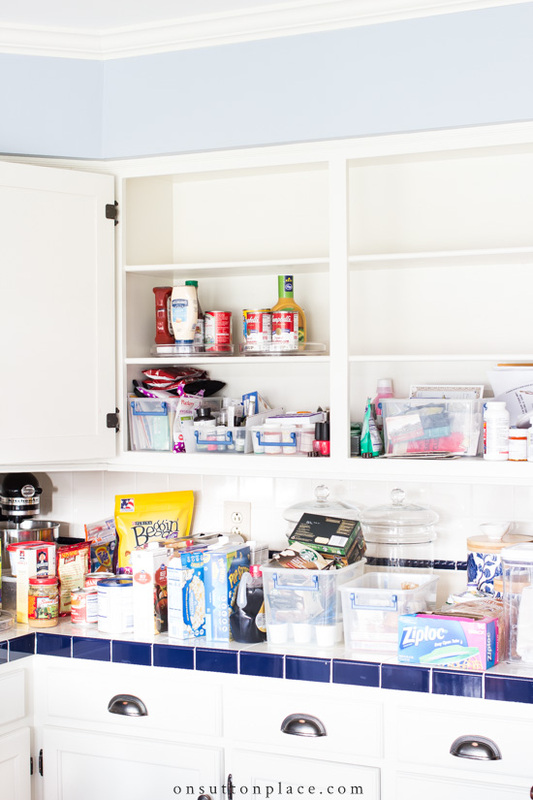 I used to have a big house with a walk in pantry and it was never a problem to organize that because I had tons of space. Now, with three small cabinets to use, it’s been a challenge. Love the lazy Susan idea for the top shelves. Thanks for keeping it real! What an inspiration. I thought for sure that you would have a walk in pantry and here you are with just what I have. I am definitely going to take your ideas about the bins. This comes at the perfect time. I have just emptied out my attic and am working on other areas of the house where the clutter is driving me crazy. Many thanks, Ann. How do you store potatoes, onions, etc. I am tired of having these items on the counter. Hi Gayle! Honestly, I store potatoes and onions in the refrigerator. I’m not sure if it’s the best place, but it works for me. My potatoes were rotting so quickly, but in the refrigerator, they last for a long time. Same with the onions! Beautiful! Very streamlined and a lot of thought into your organization! My kitchen has tons of space but after 36 years here we are downsizing to a place in town that is not on 6 acres. The challenge I am facing is losing all the wonderful cabinet space. Tremendous thanks for the idea of the bins. I too am vertically challenged. Looks great. I just semi-organized mine and found stuff I didn’t even remember buying in the back of the cabinets. Love the clear containers! Inspiring! The clear bins are definitely a great idea. Must get to work on my pantry!